Linking up with Ginny for my first ever Yarn Along! I am about two thirds done with my mom's requested kitchen towel. It has been a bit slow going...I just haven't been able to muster up the motivation to work on it for more than a few rows at a time, but I am determined to have it finished by the time we visit over Easter weekend! I wish I could say that I was reading something interesting, but I find it so hard to squeeze in time to read anything for me unless it is a parenting book. So instead, I am sharing some of our spring book favorites we have been reading for the past few weeks. what a beautiful sunny towel! 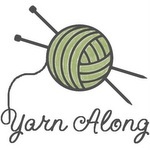 Welcome to the yarn along....it's such a great way to be inspired! Some of your books are out in our basket right now as well! Happy knitting!! Thanks Alisa! And happy knitting to you as well! It is very cheerful yellow, right! What a cheerful color! I love your other blog posts, too. We are newish Waldorf homeschoolers and I am so encouraged by your writing. Thank you :-) Where in NC are you? My husband and I grew up in the Raleigh area. Our families are still back in NC although scattered from the mountains to the coast. His job has brought us to rural Montana these past 18 months. Its a different world out here, lol. Aww, thank you Kim! We are in the Charlotte area and have been for almost 5 years now. My sister lived in Wyoming for a bit and yes, it is very different out there! I really like your towel, and yellow is just my favourite!